I’d like to start this series off by talking about someone who was and remains extremely important to the heritage of West Virginians. Someone who wasn’t even herself a native West Virginian. Ruth Ann Musick is a name very, very well known among us. When we were in elementary school, we were pointed to her section of the school library where we checked out The Telltale Lilac Bush and Coffin Hollow. These books are folklore tomes, gathered by Musick from all over the state. We would retell the tales at sleep overs, over campfires, and read them to ourselves quietly during library time. Even the kids who claimed to not be horror fans had a favorite tale from these books. Ruth Ann Musick was born in Missouri in 1897. She was a highly educated woman, getting multiple graduate degrees, but she had a love of folklore. When she was offered a teaching job at Fairmont State College in 1946, she found herself in a place that was fertile with local lore, and needing very much a way to preserve and collect it. She started courses in folklore literature at the college and she even revived the state’s folklore society that had only lasted two years and had been dead since 1917. With her at the helm, West Virginians were put back in touch with the many colorful tales from all over the state. We are viewed as a strange bunch, us mountain people (this includes other states as well) and the reason why our folklore is so rich and important is because of those very mountains. You see, it took forever for the railroads to get to the states at the heart of the Appalachian, Allegheny, and Blue Ridge mountains. We were isolated from the rest of the country and therefore, our progress was behind. Being pointed out constantly as different and weird can create a bit of an insular attitude and a pride in that which makes us different. Of course, in this day and age, the differences are not so wide anymore aside from the horrible poverty that strangles the state. But that heritage remains. The folklore, gathered and saved by Musick means something to us. Even me. I haven’t lived in that state for a decade and truth be told, I will never live there again. But, as I’ve said before, I will always be West Virginian. 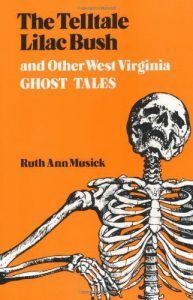 You will always find Ruth Ann Musick books on my shelves. Always. Ruth Ann Musick died in 1974 from spinal cancer, but her name is one that lives on with the people of the state whose folklore she expertly tilled and made into a lush garden of books, journals, and papers. Her writings are delivered in a simple way, void of any flare from the writer herself. Because of the nature of many of these stories, (hauntings, murders, and monsters) the cold and detached way of telling the tales somehow made them more effective. Those of us with salty, tough grandparents or great-grandparents would have found that way of telling a tale very familiar. She was so very respectful of the content and the people, and for that, we remember her with respect in turn. I’ll be pulling heavily from the two books that I referenced above in the coming weeks because, well, they are the best there are. The tales within are part of my fiber, my heritage, and my beginnings as a horror fan and author. I hope you will check out the books. If you are an Amazon shopper, it looks like Coffin Hollow is only available in ebook right now, but The Telltale Lilac Bush is available in print and I can assure you, you won’t be disappointed. Thanks for stopping by and stay tuned for next week where I’ll talk about one of my favorites: Haunted Houses! Lookin’ forward to your tales of regional hauntings and spookiness, Somer. The best kind. Bring it, I say! I’m bringing it and then some, Stuart! Thank you for commenting! Awesome, Somer! Sounds like she was a formidable woman. Thank you, Holli! She was a very busy, VERY organized person and I admire the heck out of her!